How do you like your schmaltz? Extra fatty, thick, and glopped all over the place? You do? 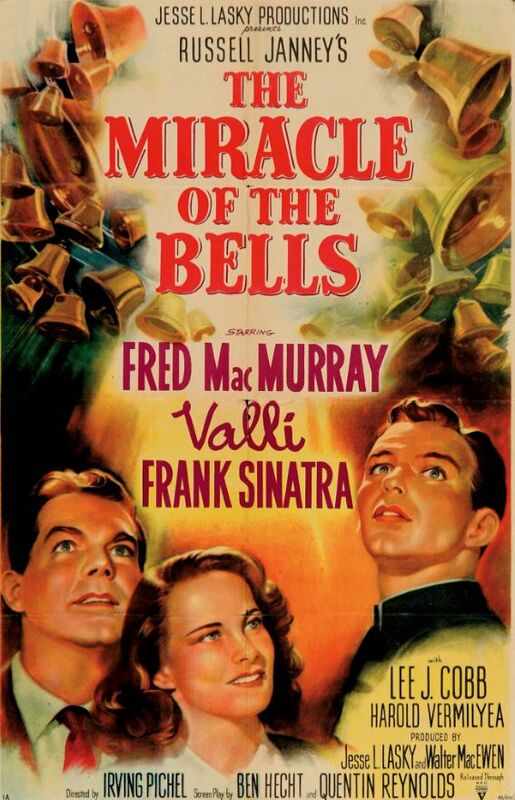 Well, Irving Pichel’s The Miracle of the Bells should satisfy your appetite, provided you don’t require nauseating Technicolor or weepy musical numbers. Everything else is in place; soft-focus feel-good spirituality, a tragic love story, and a town coming together for the greater good. Fred MacMurray plays Hollywood press agent extraordinaire Bill Dunnigan, an affable regular guy with a killer instinct when it comes to a promotional angle. One day he meets a struggling actress named Olga Treskovna (played by Italian actress Alida Valli, who’s credited as just “Valli”) and helps her get a break in a low-rent chorus line. A year later, they meet again in a small town on Christmas Eve. They have a warm and romantic meal at a Chinese restaurant run by a venerable wise man named Ming Gow (Philip Ahn). Olga coughs when Dunnigan gets up to put some Christmas carols on the jukebox, which — if you’re a connoisseur of movie clichés — means you’ve already figured out that she will die of tuberculosis. I’m not giving anything away, since the film begins with Dunnigan transporting Olga’s coffin back to her hometown of Coaltown, PA, and the rest of the film recounts her life and death through his eyes. She literally killed herself playing Joan of Arc in her first starring role, refusing to drop out even though she had TB, and her dying wish was to be buried on a hill in St. Michael’s Cathedral in Coaltown, next to her parents. To thicken the plot, Marcus Harris (Lee J. Cobb), the big-time Hollywood producer of Olga’s star turn as Joan of Arc, doesn’t want to release the film because it stars a dead woman no one’s ever heard of. Too morbid, Harris declares. Dunnigan also has to fight to have her body interred in St. Michael’s Cathedral, which is the smaller, poorer Catholic church in Coaltown, and the more popular his PR campaign becomes, the more pressure there is to have Olga’s funeral services held in the larger cathedral. 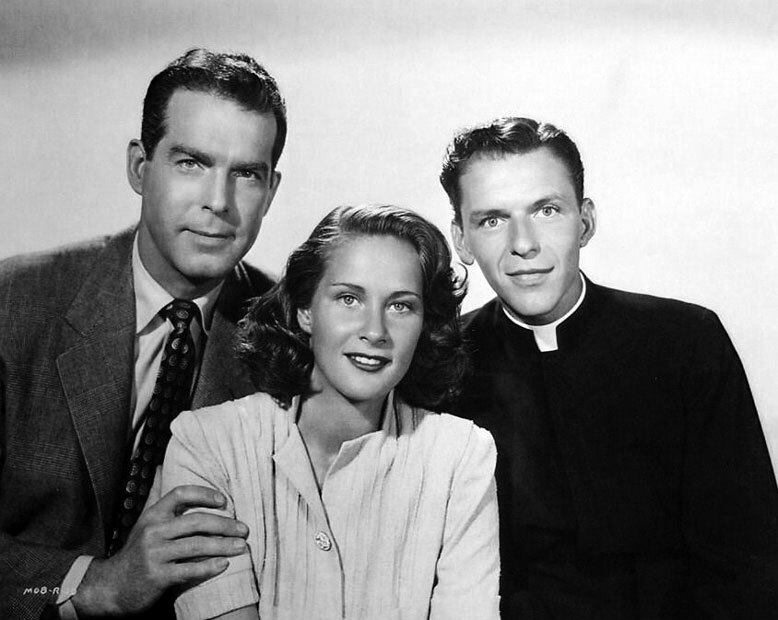 Frank Sinatra plays Father Paul, the young priest who presides over St. Michael’s, and it’s tempting to draw comparisons with another crooner who famously played a priest — Bing Crosby in Going My Way (1944) and The Bells of St. Mary’s (1945) — but Sinatra’s performance is more understated. In The Miracle of the Bells he plays a character, not a song-and-dance version of himself. Posted in 1948, March 1948 and tagged Alida Valli, Frank Sinatra, Fred MacMurray, Irving Pichel, Lee J. Cobb, Valli. Bookmark the permalink.